Most volunteer-involving organizations exist to provide services and advocate causes. The mission of these organizations focuses on a target population defined as in need of the help being provided. This is the tradition of a “charity” and the model of service suppliers assisting service recipients can be life-saving and critical to communities. However, the model can also be paternalistic and disempowering, especially if clients are seen one-dimensionally, only as people “in need.” Those of us leading volunteer engagement can easily fall into this false perception and end up overlooking the huge pool of potential talent right in front of us every day. When we need to recruit new volunteers, we habitually look outside the organization to find additional capable people to serve our clients. Leaving aside life-threatening situations, very few people are wholly defined or even constantly occupied with the need that brings them to your organization’s door. Yes, your client may want to learn to read, but meanwhile is an amazing artist. Your client may be coping with hearing loss, but continues to be capable of supervising a department at work. The frail senior who needs home-delivered meals may still be fluent in two languages. When we only see clients as their need, we discount their multi-dimensional lives. Everyone is someone else’s “client,” depending on the moment and the situation. A highly-skilled nurse might also be in marriage counseling. The probation officer may have an autistic child. Even those who work to assist people with physical disabilities may someday find themselves temporarily disabled from an accident. Depending on the services your organization provides, your clients may find it difficult to accept help – or are angry at being in their situation, or bored to tears by unproductive periods of waiting. They may have lost a degree of control and even self-respect. And, more than anyone else in the system, they experience first-hand what is working and what is not in the way your organization operates. Why are we not channeling such negative feelings into invitations to partner in making things better for everyone? Finally, while the organization must focus on the individual(s) with the presenting need, it’s rare to only see one person in a vacuum. Clients come with families, friends, employers, neighbors – any of whom may both be affected by the problem and concerned for the client. 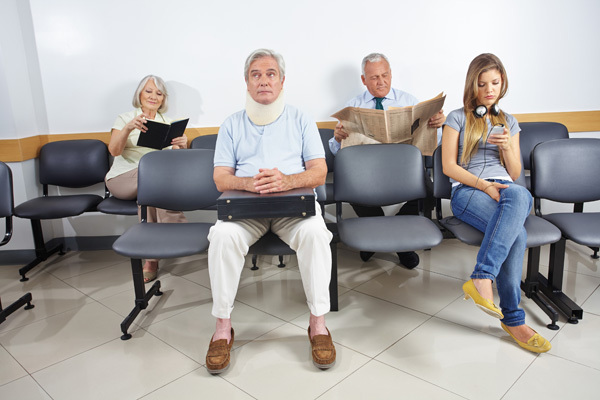 And they may be sitting in a waiting room in your facility without any opportunity to do something tangible to help. Here’s one very simple and non-intrusive way to start treating clients and their support group as multi-dimensional: place information about volunteering where they can see it. Put flyers or a bulletin board (yes, the old-fashioned kind) in the waiting room or any place clients and their support people will see it with a headline such as “Tired of Just Sitting Around?” or “Did You Know You Can Help?” You can describe any volunteer positions available, but perhaps you can offer micro-volunteering tasks that can be completed in less than an hour. This is the place for routine labor! Someone might be grateful for the mindlessness of collating information packets for 45 minutes simply as a diversion from doing nothing. Or, s/he might sit and answer a really probing assessment form that allows them to detail their experiences with your services. This is also a way to address special, immediate needs. For example, does anyone speak Korean well enough to visit for a little while with a new client whose English is poor? The key to this is being prepared for offers of help. Right then and there. So it means giving a phone number that will be answered by a live person who can put the willing offer of help to good use. For those who are wondering whether or not this effort is worth it, consider how important such opportunities might be to the mood and frame of mind of those receiving services. If you do not see on-the-spot volunteering as feasible, at least make sure that whenever a client stops being a client s/he is invited to consider becoming a volunteer at some point in the future. Provide information about “giving back” or “sharing your experience with others in the same situation” during an exit interview or discharge meeting. Believe me – your development office is planning to ask the former client for a financial donation at some point in the future, so why not make the pitch to volunteer? How might clients help one another? Some ideas are obvious, yet rarely facilitated. How about carpooling to get to appointments (both among clients and for their family members)? Ways to share/exchange things needed while undergoing treatment or a service that can be re-used when the client reaches a new stage? Setting aside a table in the cafeteria specifically for those in the middle of a long day on site, where they can simply meet informally and share their stories (set a specific time for the meal so people can plan on showing up)? You may never record these kinds of things as formal volunteer work, but the volunteer office is in a unique position to stimulate these kinds of exchanges – and to assign other volunteers to coordinate them, too. Note that all of this is voluntary and non-coercive. You are offering opportunities that benefit the client while benefitting others. During the Superdome shelter fiasco in New Orleans during Hurricane Katrina in 2005, colleague and friend Jayne Cravens turned my perspective upside down when she observed, “Why are officials acting like those people can’t do anything for themselves?” Once displaced residents were deposited at the Superdome, everyone expected for help to be brought to them. Of course they needed supplies and medical care, but why were these often able-bodied people in shared circumstances not given the chance to organize into teams of workers – cooks or food servers, clean-up crews, information disseminators – to help one another? Rather than sitting and waiting only for outside support, think about the effect of having something meaningful to do that would have improved the situation for everyone. There are far less extreme situations in which ignoring clients as both a source of ideas or of help simply wastes talent. This is often the case when we plan things for teenagers or even younger children. You’ll be amazed at the creative ideas they may have for new activities or better ways to do activities in place now. But you need to ask for those ideas, probably in different ways than you would ask a “planning committee” of adults. Someone once told me she was tired of her young son hanging around during preparations for a fundraising carnival and so she challenged him to “create a booth for kids your age” (around 9). After a week or so, he came up with a used toy collection, to which any child could donate a no-longer favorite toy for someone else. It was a big hit. Several years ago I heard a presenter at a conference for hospital administrators describe a unique project in a kidney dialysis unit. Patients approached the nurses with a plan to combat boredom, get some exercise, and do some good. They proposed setting up some stationary bicycles and starting a competition! Patients who wanted to join in registered as “racers” and set goals for how many miles they would bike in one spot. They also obtained “sponsors” so they could raise money, just like an outdoors bike race would. Over a period of weeks participants would record their mileage on a wall chart until the race was over and the winners announced. Apparently (no surprise!) the atmosphere in the dialysis unit was very exciting for quite some time. Ultimately, don’t we want clients to be partners with staff, outside volunteers, and fellow clients in making things better for everyone? As often happens with my Hot Topics, I share ideas but know that some readers will be filled with how-to questions and concerns about risks and obstacles. It’s easy to spark ideas and harder to make them work in the real world. Is a client “entitled” to do something just because s/he wants to? How can we insure that a client volunteer follows the same rules and safety procedures we require of any other volunteer? How do we make sure that not succeeding as a volunteer does not jeopardize the client’s ability to get the services needed? Just because there are things that need to be considered seriously does not mean a concept won’t work nor that a small idea can’t be pilot tested. If you take nothing else from this Hot Topic, take a second look at your clients and the people they bring with them into the organization. Have you been seeing them as only “in need”? Who are they as individuals and what is their potential to participate in serving others as well as themselves? Can you share examples of clients as volunteers? How have you implemented this concept – and where were the pitfalls? Thanks for the quote! I remember another time when I was working at Maxtor Corporation, and had arranged for our facilities department staff to have a day of volunteering at a nearby shelter for families. The staff would be painting some rooms and doing some much-needed minor repairs. While they were working, clients expressed interest in joining in, but the shelter said no, because of liability and whatever. The shelter provided no ways for clients to help out at all, for fear of getting sued - not that I can find a case of that happening... This was back in the early 1990s - I hope things have changed. "Can you share examples of clients as volunteers?" Here’s an example, from my own blog (http://coyotecommunications.com/coyoteblog/2015/10/12/adelante/): Adelante Mujeres is a nonprofit in Western Washington County, Oregon, about 30 minutes west of Portland. It provides education and empowerment opportunities to low-income Latina women and their families, in order to ensure their full participation and active leadership in the community. Its Chicas Youth Development works with more than 400 Latina students, grades three through 12, with the goal of instilling the importance of community leadership and civic engagement, and cultivating their skills for school, for future studies, for careers, and for life. The students, as volunteers, provide tech help at public libraries, pick up trash, plant trees and engage in other activities around the area. The participants in this program are role models for younger girls in the community, encouraging those younger girls to become volunteers, and leaders, themselves. The Chicas program has been selected as a 2015 Oregon Governor’s Volunteer Award Winner. And think of the stereotypes this overturns, when you are at the library, using the computer, and need tech assistance, and you get it from a teen aged Latina girl. I SO love this program! Another great article Susan - I couldn't agree more. We have many current and former clients that volunteer in different capacities in our agency. After all, who could be more empathetic to those in difficult circumstances than those who have faced the same struggles? Thanks, Laura, for confirming the principle that -- if given the opportunity (also to say no) -- many people welcome the chance to share their experience with others. Hi, Missy -- You may want to consider developing a "starter set" of assignments that can be done in under, say, a month and ask all new volunteers (whether clients or not) to begin with those. Call it a "get acquainted" period rather than "probationary" and give both sides the chance to find their comfort zone. Of course, you can always have highly skilled roles that by-pass this step, if the candidate can provide evidence of already having the expertise needed. Most important is to HAVE volunteer position descriptions that specify what an applicants needs to bring to the role. And never imply that all applicants are automatically accepted -- again, this should be true any prospective volunteer, client or not. Make it clear someone needs to apply. In over 43 years of full-time professional work in volunteer program administration, I found people we served (adults in mental health recovery) to be excellent volunteer candidates. In many cases, their experience of volunteering was life-transforming. They gained new feelings of self-worth and competence. They resumed interrupted educations, obtained credentials and became practitioners of care to others in mental health recovery. They became self-supporting, contributing members of society. All this because their door to volunteering was opened. Sadly, many volunteer administration professionals discriminate against this population, losing an amazing resource. Hi, Bob (nice to hear from you after a long time) -- Thanks for sharing your experience.